GridViewImageColumn displays read-only images for database columns of image data (OLE container or BLOB). RadGridView tries to convert data columns that contain unspecified binary data to an image. Some databases such as Access use OLE image container. RadGridView automatically recognizes that and skips the added header. Supported image formats are those supported by the Image class of the .NET Framework. Tile: The image is repeated. 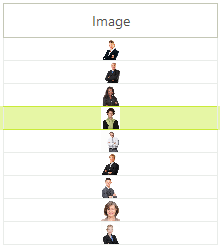 Center: The image is positioned at the cell center regardless of the ImageAlignment value. Stretch: The image is stretched in the cell. Zoom: The image is zoomed but the aspect ratio is preserved.